"Zen Gardens has fulfilled that dream to perfection - creating a peaceful stroll garden with many magical places. We have had challenges with deer in the past. Yoshi and Dorothy used plants that are both traditional and unattractive to the deer. We no longer have that problem. We enjoy being in the garden, and appreciate the special views from inside our home. It is more than we could ever have hoped for." "Going into the project I had done quite a bit of research. 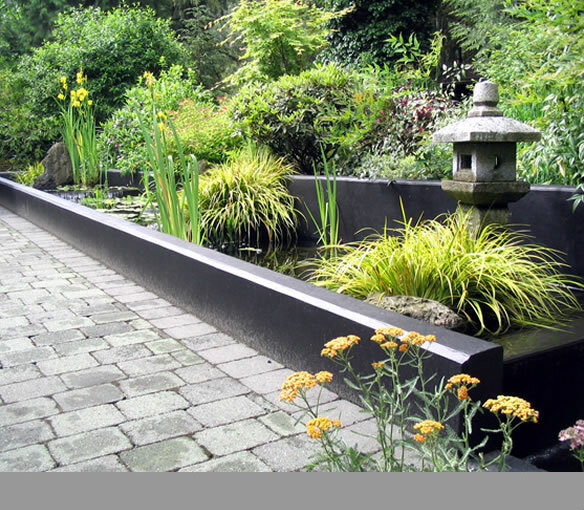 I knew that I wanted was a contemporary Japanese garden with sculptural and textural qualities from the material as well as colour and structure in the plantings. The garden had to be easily maintained. The new garden also had to visually connect that segment of the property to the next existing garden. Yoshi's design was beyond anything that I could have envisioned for the space. He transformed an awkward, unusable space into a visually stunning area of my garden to be enjoyed from the ground as well as the deck above. I have been impressed with Dorothy and Yoshi's professionalism. They delivered the design in the time frame they promised and on budget despite the inclement weather and challenging access demands. I hope to continue expanding my landscape designs with them in the years to come. " "We became acquainted with Yoshi and Dorothy a dozen years ago and commissioned them to redo our backyard as a 'Japanese garden.' Yoshi is very particular, a very good listener and thorough planner who provided us with a very accurate and understandable plan of what he proposed to do and then applied to the smallest detail. Yoshi and Dorothy have maintained this Garden since, and have also twice made some significant design extensions that were much appreciated. " "Zen Gardens have done a magnificent job in designing, creating, building, and maintaining the several gardens around my heritage home. I looked at a number of designs by other noted landscape architects, but while they were good, none had the beauty and serenity of Yoshi's designs. None could match his artistic ability to visualize what worked best in the space and constraints given. The small gardens he designed for me are just as beautiful as the large one he also did. I found Yoshi and Dorothy have been very helpful with my questions at all times about the designs. Their advice has always been well thought out and complete. They have always been willing to modify the designs to take into account my desires for certain plants or materials. Not only have they created and built my gardens, but have also always stood behind their work. A beautiful garden is only as beautiful as long as it is maintained and looked after by one whom understands it, and their willingness to do this is much appreciated. However, I should also like to note that their gardens are so well designed that not a lot of maintenance is necessary and they are beautiful in all seasons. " "I consider myself honored to be the owner of a peaceful place in the middle of a busy, noisy neighborhood. Yoshi and Dorothy are a remarkable team, and my husband and I were thrilled to have them design and build our Japanese garden. Traditional Japanese form is present in the physical form of Yoshi and Dorothy's work, such as in design, rock selection and placement, traditional fence building (by hand) and plant selection and placement. For most people who desire a Japanese garden, the journey of their garden is important. To have Yoshi and Dorothy honour the space with their calm quiet working style, use of traditional hand tools, and genuine contemplation brings a depth of creation that is rarely seen these days. My garden looks beautiful and follows traditional Japanese form. But it also feels beautiful, and this is meaningful indeed. " "Yoshihiro recommended a design based on the physical location as well as my personal preferences and gardening skills. Many people have visited my patio and been amazed at the peaceful tranquility achieved in the concrete city. " "I had Yoshi and Dorothy of Zen Gardens create my 7th floor apartment roof top garden. Their ability to intuitively create a magical sanctuary out of a pile of dirt on the 7th floor is in itself a feat. I looked at that pile of dirt for over a year and in two weeks they transformed the space into something beyond my wildest imagination. When I saw Zen Garden's booth at the Home & Garden Show, I thought they would be able to take the ideas I had in my head and turn them into reality. I didn't expect that they would be able to provide more than even I could see in my mind's eye. I can't imagine making one single change. " "My wife and I had Zen Gardens put in a Japanese style garden as part of landscaping our lot. The result has been an ongoing delight to us. It is beautiful and amazingly low maintenance and has transformed our yard. Where it was a just ordinary space is now a restful relaxing retreat. Some things turn out better than one even imagines. This has been one of those experiences. "